Use on cabinets, small doors and other home d?cor projects. Light duty track and hangers for light applications. Includes connecting adaptor, fasteners and spacers. 75 lbs. door safe working load. Adds rustic appeal to interior door openings. 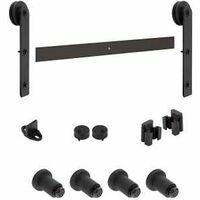 Includes all mounting hardware and components to hang one interior door. Accommodates openings of up to 36-in wide; for openings wider than 36-in use multiple kits. For single doors 1 3/8-in and 1 3/4-in thick. 250 lbs. door safe working load. Designed and tested to follow ANSI/BHMA Grade 1 Standards. Use connecting adaptor N187-001 to connect multiple pieces of track.